Where is Bridging located? When are you open? Bridging will be CLOSED Thursday, November 22 and Friday, November 23 in observance of the Thanksgiving holiday. We are open 9am-3pm Saturday, November 24. Bridging has two locations in the Twin Cities. Friday – Saturday: 9:00 a.m. – 3:00 p.m. Note: Bridging is closed on all major holidays. Please call or check online if we are open. Donors: Drop off your furniture and household goods for free, no appointment necessary when making a donation at a warehouse. Bridging staff and volunteers are on hand to help you offload. Pull up directly to an overhead garage door. Will you come to my house and pick up donations? Yes, we have fee-based home pick up service! Residential donors can schedule a fee-based home pickup in the 7-county metro area. This year-round service can be scheduled online or with a Bridging representative by calling our main phone, 952.888.1105. Appointments are made for 4-hour blocks. We generally book 1-2 weeks out. Options available for both outside or inside your home. Ready to book your own appointment online? Learn more and schedule now. Why is this service fee-based? Bridging is a non-profit organization that provides donated items to clients in need. Our fleet of vehicles cost our organization over $100,000 per year to maintain and insure. We ask that our community of donors help pay for this expense by paying the fee for pickup service. If we didn’t ask our community to help, we would not have adequate funding available to run the trucks. Thus, the program would not be available. You can also drop off donations at one of our two locations, Bloomington or Roseville, Monday through Saturday. No appointment necessary. Staff and volunteers are available to assist in unloading your vehicle. Check hours of operation and holiday schedules. How do clients get an appointment at Bridging? Through the effective reuse of donated items, Bridging improves lives by providing a basic home essential package of quality furniture and household goods to those transitioning out of homelessness and poverty. By relieving the pressure to purchase furnishings, Bridging provides families a comfortable home which allows them to focus on other crucial matters in their life. How do individuals and families receive services at Bridging? Clients are referred to Bridging through a network of nearly 150 local social service agency partners. Agencies range from; county assistance programs, faith-based organizations, shelters, emergency assistance, mental health services, veteran and disability programs and immigrant/refugee services. Referring agencies/caseworkers determine the household needs and schedule the shopping appointment at a Bridging warehouse (Bloomington or Roseville). There is a $60 Appointment Fee which may be paid by the agency partner or the client. How do I get information about my appointment at Bridging? If you have questions about your upcoming appointment (i.e. location, time, paperwork), please contact your caseworker or agency directly to find out when you are scheduled to choose your items at Bridging. If you have already shopped for your items, you can contact the Bridging warehouse directly (Bloomington/Roseville) by referencing the materials given to you at the check in window upon arrival. The reminder sheet has a direct phone number to reach a staff member in the warehouse. All clients must be referred to Bridging by one of our 100+ partner agencies. Can I volunteer at Bridging? We rely on volunteers to do just about everything at Bridging. In addition to being a great way to give back to those in need, volunteering is a terrific opportunity for team building, socializing and staying active. Without your help, we simply could not help those in need throughout the Twin Cities. Bridging has a full MENU of volunteer opportunities for both in a warehouse and in the community. Year-round individual (below) and group engagement options available. Learn more about our Dresser Sponsorship program, how to Host an Essentials Drive, and invite us to a speaking engagement or community fair. Individual Options: Individual volunteers fulfill the roles of warehouse assistance, product sorting, client shopping, office support, furniture/electrical repair and driving truck for product pickup. There’s no need to fill out an application or commit to a specific opportunity just yet. We’d love to show you around our warehouse, explain what we do at Bridging and provide more information on the various volunteer opportunities available. The 30-40 minute tour will give you a better idea of how individual volunteers make a positive impact in the lives of others. Please note: All hands-on volunteers must be 14 years of age or older and all shifts are scheduled ahead of time. NEXT STEP: Complete a Volunteer Interest Form and we will be in touch! What is the Bedrace for Bridging? 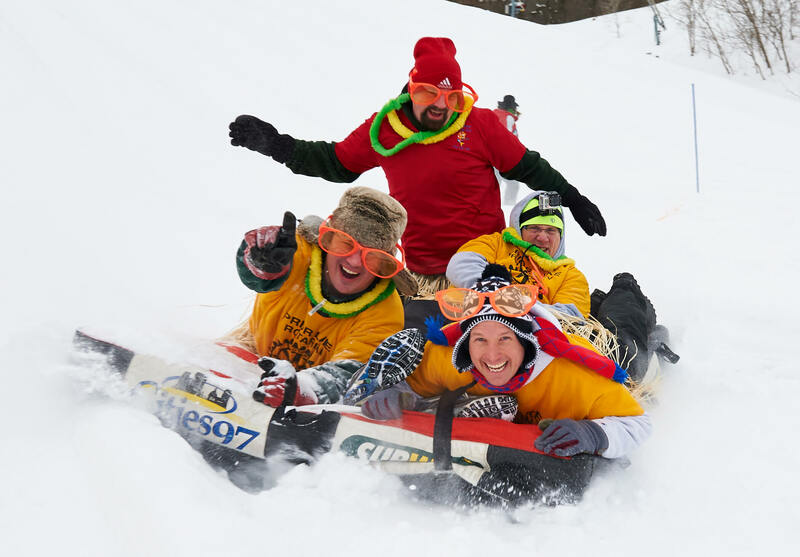 On Saturday, March 10, YOU can race down Buck Hill on a queen mattress to raise funds for Bridging. Register for the 20th Annual SUBWAY® Bedrace for Bridging, presented by Cities 97. Get your extreme team of four together now for the race of the year and help Bridging furnish homes with hope. Prizes awarded for fastest teams, best costumes and most funds raised for Bridging. And the best part is, you will help provide essential household furnishings to those in need. Check out last year’s wild and action-packed photos. Don’t miss this one-of-a-kind winter experience! Since 1998, the annual Bedrace for Bridging has been a local favorite winter fundraiser and signature event for Bridging. All money raised goes directly to Bridging to furnish homes with hope. Come in costume for a chance to win the Cities 97 Costume Contest. Stay for the post-race concert! Prizes include; concert tickets, food, awards, and more. Watch the Bedrace video and visit the event website for full details. How do I donate items from my company? I have a large quantity of items. Non-residential donors are vital to stocking our shelves! In fact, 30% of our product is provided by organizations such as those listed below. Who is a “non-residential” donor? Check out the complete Donate Your Stuff list and make sure we accept the items you want to get rid of today. All acceptable items must meet our quality standard and be ready to load. Your donation is tax-deductible. No appointment needed. No online booking required. Donations accepted: Monday – Thursday, 9 a.m. – 6 p.m. and Fridays/Saturdays, 9 a.m. to 3 p.m. Bridging is closed on Sundays and all major holidays. Need help getting your items to Bridging? Contact Steve Jameson, Operations and Logistics Manager, via the online Contact Form. Corporate/institutional pickups are Mondays – Thursdays between 9:00 a.m. – 3:00 p.m. and Fridays 9 a.m. – 12:00 p.m.
How do I get a receipt for donating items? Bridging is a 501 (c)(3) nonprofit organization. Donors may claim a tax deduction for items donated to Bridging. When and where can I get a donation receipt? General receipts are available at Bridging’s warehouse dock doors and in the front office. Bridging does not provide values ($) for donations it receives. The IRS requires that the donor estimate the fair market value of donated items. For reference in determining value and additional information visit www.irs.gov or contact your tax advisor. If the value of the donated items is less than $250; the donor can fill out the general donation on the paper receipt and use it for their tax records. To obtain this acknowledgement, the donor must email the request to RECEIPT@BRIDGING.ORG. The request must include; donor name, address, email address, the date of the donation, and a description of the items donated. Bridging will provide a statement, via email back to the donor that acknowledges the donated item(s), not the value. Letters take up to 7 business days to process. Questions? Please contact Myra Van Delist, Business Services Manager. Will Bridging refuse a furniture donation? Yes, when the item does not meet our quality standard. It is important to Bridging that we provide quality, essential furniture and household goods to our clients when they are shopping in the warehouse. Therefore, we are unable to accept items that are not on our accepted donations list and/or are stained, ripped, torn, and/or include pet hair. Team members have the right to refuse items that do not meet our quality standard. This may be done at our warehouse or on a residential home pick up. All items must be clean and in good working condition (fully-functioning). If it’s not on the Donate Your Stuff list, we don’t take it. My item does not meet your size restrictions. It’s very good quality. Why won’t you accept it? Thank you for considering Bridging as donation option for your item. 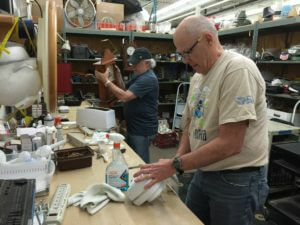 Your support is instrumental to our ability to serve the Twin Cities community in need with quality, reusable items. In order to meet the needs of most of our clients who are transitioning from homelessness into smaller apartments or live up narrow staircases, we have to make sure the items we receive will work within those smaller spaces. We can only accept the item if it meets our dimension requirements, otherwise the items do not get chosen, and they take up valuable warehouse space. Please note the size restrictions on our donation list, in particular on our wood furniture pieces. How do I get a bed from Bridging? NOTE: Bridging does not schedule appointments for used beds only. Bridging provides the basic home essentials to over 85 households in need each week in the Twin Cities. During a Bridging appointment, donated used beds are provided based on family size and availability. To receive Bridging’s services, you must be referred by one of our partner agencies. 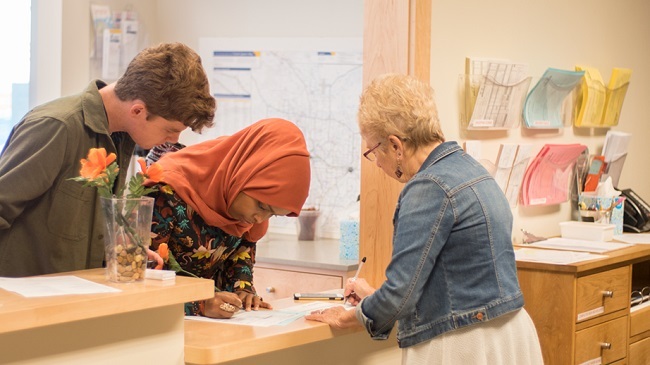 Bridging works with nearly 150 agencies across the Twin Cities metro area to help clients receive assistance when setting up their new home with furniture and household goods. Your agency or caseworker will schedule an appointment for you to gain access to the warehouse. All clients must be referred by one of our partner agencies in order to receive beds and furniture. An appointment at Bridging typically includes; beds, upholstered furniture, dressers, lamps, kitchen table/chairs, small appliances, dishware/glassware, silverware, wood furniture, pillows, blankets, linens and various kitchen essentials (based on available donated inventory). HOW CAN I PURCHASE A NEW BED? In order to purchase NEW bed from Bridging, you must be referred by one of our partner agencies. The purchase program is open to all past and present clients who have been referred to Bridging. This program allows NEW mattresses, box springs and bed frames to be available at a discounted price. Clients may purchase as many mattress/box spring sets and bed frames as needed. The mattresses are of innerspring construction with a quilted top. Where can I take an item that Bridging won’t accept? Do you have other usable items to donate but don’t know where to take them in the Twin Cities? We know how difficult it can be to locate other organizations and non-profits in town who would like to put your usable item to good use. Check out our most recent list of 2019 Donor Resource List. We annually update this list for donors and are happy to provide it to you. This list is also available at our dock doors and front desk. This resource list includes where to donate items such as; office furniture, large appliances, clothing, sporting goods, child/infant items, building materials, etc. Fran is The Man! The Man With the Plan! In 1987 Fran Heitzman, a former business owner and entrepreneur, was the custodian at Pax Christi Church in Eden Prairie, Minnesota. On a whim, a woman brought a piece of furniture to the church and asked Fran if it could be used in the children’s nursery. Fran said no, but he was sure he could find a home for it. He then started making phone calls and found a social service agency that said they would be thrilled to receive the furniture. That was the moment Bridging was born. Fran thought that if he could find a home for that piece of furniture, then he should be able to find a home for even more furniture – this idea could bridge the gap between those who have and those who have not. Thanks to Founder Fran, for over thirty years the impact Bridging has made in the lives of local families in need, the environment, and its volunteer community is monumental. Each year, Bridging continues to bring hope and stability to over 4,000 local households in need. Fran continues to motivate the Bridging team of volunteers and staff every day. His passion for serving local families in need is as strong as ever! Why do you test your items? Our quality standards help us to deliver a consistent and dignified experience to our clients as they look to get a fresh start. For our electronic items and small appliances, it’s important to make sure that the item is safe for use for our clients. Sometimes older electronics such as microwaves can leak radiation. It is for this reason that we make sure to test everything that has a plug or battery. The basic question we ask our donors to answer is, “would you feel comfortable donating this item to a friend, family member, or neighbor?” If the answer is, “yes”, we’d love to take your item(s), if not, please take a look at our 2017 Donor Resource List, where we have outlined some other organizations that may be able to accept your item. Check out the full list of small appliances and electronics we accept. How do I make a gift of stock or bonds to Bridging? Increase your gift to Bridging and your tax donation with a gift of stock. Donations of stock allow us to ensure that even more clients have the basic home essentials to furnish their home with hope. Gifts of stock can make a big impact by donating long-term appreciated securities, including stock, bonds and mutual funds to Bridging. For more information and to plan a stock transfer: contact Maggie Mau, Donor Relations Manager, 952.888.0777 or maggie.mau@bridging.org. She will help ensure proper receipt and acknowledgement of your generous donation. How do I make a financial gift to Bridging? Setting up a recurring gift is convenient, customizable, and environmentally friendly. Most important, recurring gifts ensure a steady source of support for Bridging. To setup a recurring gift, contact Maggie Mau, Donor Relations Manager, 952.888.0777 or maggie.mau@bridging.org. Planned Gifts help you prepare for your future, allow you to take sizeable income, gift, and estate tax deductions, and provide favorable capital gains tax treatment. They can also provide income for you and your loved ones for life. Consider including Bridging in your estate plans. If you already have done so, please let us know. Otherwise, we would be happy to discuss your Planned Giving options to Bridging. For more information contact Maggie Mau, Donor Relations Manager, 952.888.0777 or maggie.mau@bridging.org. How do I honor Bridging with a planned gift? As a Bridging supporter, you know we depend on your financial generosity. Every gift we receive—large or small—is important to us, because YOU make it possible for us to serve over 4,000 households every year. Throughout our history, Bridging has expanded the boundaries of what is possible –providing a consistent shopping experience for clients, increasing our capacity, and growing our volunteer base through meaningful engagement. One driving force behind these advances is the friends of Bridging who make more possible today, and every day, through Planned Giving. With many Planned Giving options available, you can provide a lasting gift and help us do more for more people. Planned Gifts help you prepare for your future, allow you to take sizeable income, gift, and estate tax deductions, and provide favorable capital gains tax treatment. They can also provide income for you and your loved ones for life. Consider including Bridging in your estate plans. If you already have done so, please let us know. Otherwise, we would happy to discuss your Planned Giving to Bridging.